Best Practice Guides were produced in collaboration with Crossrail’s Tier 1 contractors and other professional bodies e.g.IOSH . Guides were produced in response to specific project activities and were aimed at raising Health and Safety standards through the sharing of knowledge and experience of the companies working on the programme. 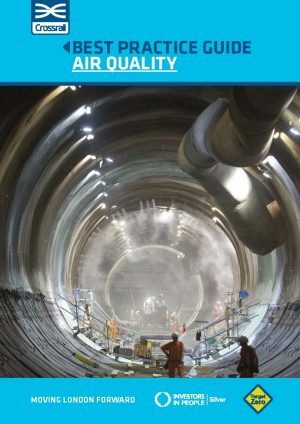 The purpose of this guide is to provide information to help users to better understand the health hazards associated with tunnelling and how to control the risks, some of which are carcinogens. The guide is for use by designers, site engineers, supervisors and health and safety advisers and provides information and guidance that will help to ensure that the risk associated with air quality are kept as low as practicable. In addition it provides information on the importance of ventilation systems in a changing environment. The guide has been informed by research findings. This document is applicable to any construction project where there is a requirement to manage air quality. It is relevant to SMEs in terms of diesel plant, ventilation and PPE.